Animal Control had been working with the owners of Dallas and his companion Tex for almost a year before they finally came to the sanctuary. The officer tried to educate the couple on caring for the horses better. The couple had no knowledge of horses--the wife didn't even know what 'gelding' or 'mare' meant. There was no vet care for the two horses during the year they were with these people. After losing his job and only being able to afford one bag of sweetfeed for the two horses, the husband was willing to relinquish the two horses. The wife needed more convincing despite the fact that Tex was dangerously thin. 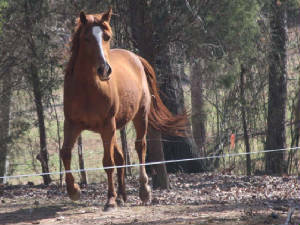 Finally they agreed that they could no longer afford the two horses and let them come to the HPS sanctuarry. Dallas has lost the worm belly that he arrived with and has had his rabies shots and yearly dental care. The equine dentist determined him to be 7 years old at that time. 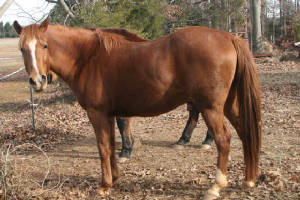 Dallas is currently in our riding program and ready to be placed in a quality loving home. He has a sweet, playful nature and good ground manners. He leads, loads, and is good for the farrier. We are riding him Western at the present and he shows signs of being started on neck reining. He would be good for an upper intermediate rider. Please contact the sanctuary if you are interested in meeting Dallas and offering him a forever home.